LAHORE: (Saturday, April 29, 2017): Punjab University Vice Chancellor Prof Dr Zafar Mueen Nasir has said that Punjab University was focusing on quality of research and education. He was talking to an 18-member delegation of Islamabad-based education reporters during its visit organized by Higher Education Commission of Pakistan at Undergraduate Block here on Saturday. HEC Director Media Ayesha Ikram, PU Registrar Dr Muhammad Khalid Khan and deans of various faculties were present on the occasion. Addressing the meeting, Dr Zaffar Mueen Nasir said that PU was focusing on uplifting Pakistan as well as development of society. Ms Ayesha Ikram said that the purpose of the visit was to show academic developments in the universities to media. On the occasion, Dean Faculty of Life Sciences Prof Dr Muhammad Naeem Khan gave a detailed briefing on the history and faculties of Punjab University. 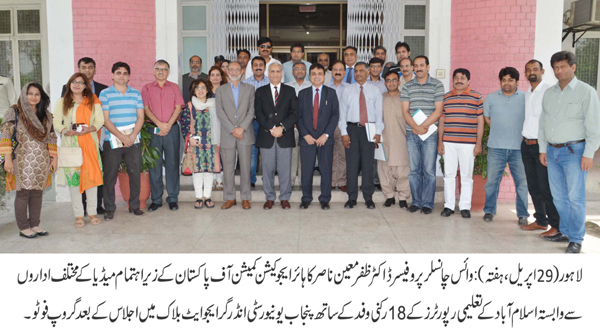 Later, the delegation visited Institute of Communication Studies and Punjab University Library.